Mickey Mouse is a birthday classic, and he's always ready to have fun when you shop the Mickey Mouse Party Supplies! You'll be able to find things like incredible, colorful party favors, helpful tableware like dinner and dessert plates, decorations like plastic table covers, a bunch of different balloon styles, and table decorating kits, as well as personalized items like mugs, banners, invitations, and more! When it comes to birthday fun, you can't go wrong with Mickey Mouse. M-I-C … K-E-Y … M-O-U-S-E. It's a name many children learn to spell before they learn to read and write thanks to the Mickey Mouse Club song. His lovable spirit, friendly attitude and enjoyment in taking big adventures with his pals make this the perfect theme for a children's birthday party. Everyone's favorite mouse will get the kids giggling with his big ears and white gloves. Don't worry about the decorations, as we have all the birthday supplies – including headbands featuring his trademark black ears. In fact, we have everything you'll need to make the entire party about Mickey. Just get the spirit going with the Mickey Mouse song and you're set. This Mickey Mouse craft project is perfect for a party. Before the party, cut round potatoes in half so you have circular stamping shapes. Have children paint them with black watercolor using a brush and then stamp Mickey's head on a brown paper bag. Let the bags dry and send them home filled with party gifts. Mickey Mouse's trademark ears are his signature look, giving you plenty of fun decorating options. Use black balloons tied together to create ear shapes on the walls around the room. They'll make a great take-home gift for the kids. You can also serve cake on black plates connected in the Mickey Mouse silhouette shape. 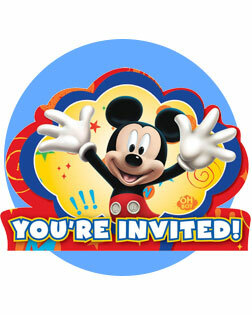 When kids get an invitation with Mickey Mouse on the front, they're going to be very excited for the party. That's because every kid connects Mickey with fun, and who doesn't want to go to a fun party? These invitations are just a hint of the fun you have planned for the big birthday adventure. Balloons, costumes, hanging streamers and more – you can go all out to decorate for your Mickey Mouse-themed birthday party. We have table decorations, party supplies and even Mickey Mouse ears to make the party a fun adventure for all. From the moment they step inside the house, Mickey and his gang of friends will have the kids enjoying all the festivities. Hold onto something solid, because once you have your house decorated in Mickey Mouse-themed goods, the journey will begin. A Mickey Mouse party must have balloons, and this bouquet is exactly what you need to get the theme right. With red Mickey-Mouse-shaped ears, blue stars and Mickey himself in a relaxed pose and smiling, these balloons will start the party off with fun style. Spirals and curlicues bring excitement to party decorations. These hanging swirls featuring Mickey Mouse and his friends can decorate your entryway, add energy to the party room or create some excitement over the cake table. They're simple to hang and take down once the party is over. Mickey's smiling face is the perfect backdrop for a child's birthday party, especially when it comes to the tableware. We have cups, napkins, plastic ware and plates all decorated with Mickey Mouse and his friends. Featuring everyone's favorite mouse, these decorations will be a hit for your child's birthday party. Serve chocolate cake on Mickey's beautiful smile, or drinks from cups featuring his signature ears. These table decorations will cap off the Mickey Mouse theme perfectly, and they will also provide you with the utensils needed for serving children's favorite party treats: cake and ice cream. Mickey Mouse is always actively involved in fun adventures, and the children at your party will want to do the same. You can maintain in control during any sign of trouble – which Mickey is known to get into from time to time – with these great party activities. Keep the children entertained with games, costumes and craft projects. They'll be busy hopping from one activity to the next just like Mickey Mouse hops from one adventure to the next. Check out the Mickey Mouse-themed activities we have that will elicit delightful giggles from all the party guests. It will be a very fun time for all. A large Mickey Mouse head filled with candy – what could be a better party activity than swinging at this piñata? We even provide you with a colorful piñata buster stick for breaking the piñata open. Mickey has a wide smile on his face, making the game even more fun for children and adults. Mickey Mouse has lost his nose! Help Mickey find the right nose with the Pin the Nose on Mickey Party Game. Your party will love this classic-style game with a Disney twist. Mickey would never send his pals home without something special to remember the event, so be sure to include some of these party favors in a surprise gift bag for all the party guests. 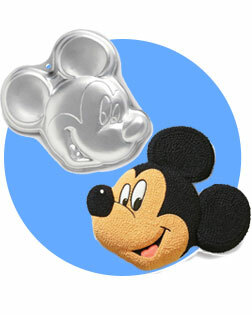 They can be edible treats, fun crafts or exciting trinkets all featuring Mickey Mouse. This party container will make your life very easy, and party guests will continue to have fun with Mickey Mouse well after the party has ended. 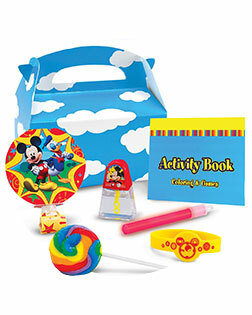 The fun lives on with these awesome Mickey Mouse party favors. 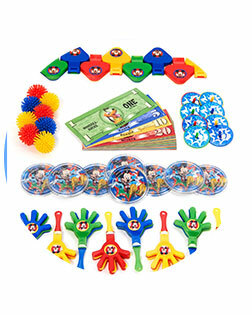 Our value pack has all the Mickey Mouse essentials: treat bags, backpack clips, whistles, jumbo stickers, activity sheets and plastic springs. Everyone will leave the party with enough fun activities to keep them busy for many days.